Thought I’d amuse you with an anecdotal little tale of child training. Mommy: Yes Lance? Do you need help? Lance then signs help and I figure out whatever is bothering him. When Daddy is around the scene changes slightly. In other news, we had the kids doctor visit over Thanksgiving and I got a copy of their growth charts so you can see what I’m talking about. 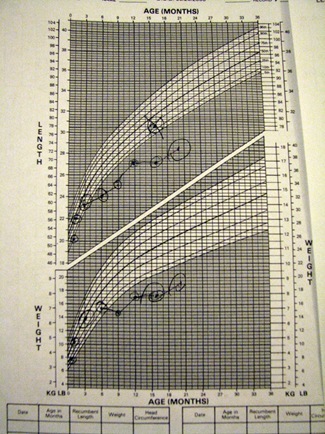 The diagonal lines indicate the normal range of length and height in children – the dots with circles indicate my children. This is Ivy – stretching the upper limits for her age. And this is Lance – well below short. People always said your first and second kids would be totally opposite, I just didn’t think it would be in this way. 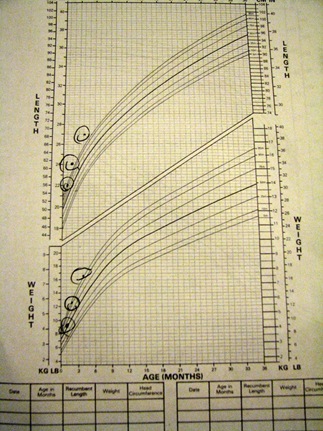 At this rate Ivy is going to catch Lance in weight and size within a few months; like most second born children she’s already super competitive!